The AKB is both streetwise and classically trained. The seven band members embody the spiritual kindred of the klezmorim: the professional Jewish musicians who travelled across Eastern Europe two centuries ago. However, the band is not dogmatic or limited by traditions and expectations. The AKB embraces the most diverse musical styles and cultures as they go along. Influences from jazz, ska, dance or hip-hop fall effortlessly into place. 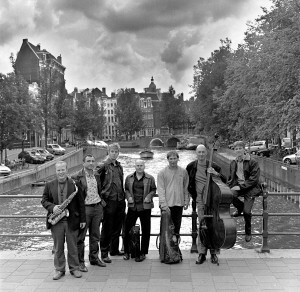 The result is a distinctive breed of progressive Klezmer music, in which the Amsterdam spirit of freedom and tolerance is always present. The band plays clubs, concert venues, and festivals all over the world. They have performed in 34 countries, including Brazil, Mexico and South Korea. The AKB was successful long before the Balkan hype became a worldwide phenomenon. 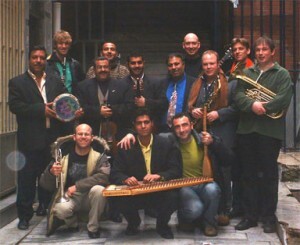 It turned out that their unique sound was perfect for the popular Balkan Beats. Many of their songs were being sampled and mixed by dance producers. The Shantel mix Sadagora Hot Dub, for example, became a genuine club hit. The band’s creative and innovative attitude continues to inspire a new generation of fellow musicians. The band frequently collaborates with guest musicians and producers. To promote 2014 album Blitzmash, the band hit the road with an XL line-up, including drums and electronics, adding even more power and urgency to their music. The Blitzmash extravaganza became an international club and festival hit. 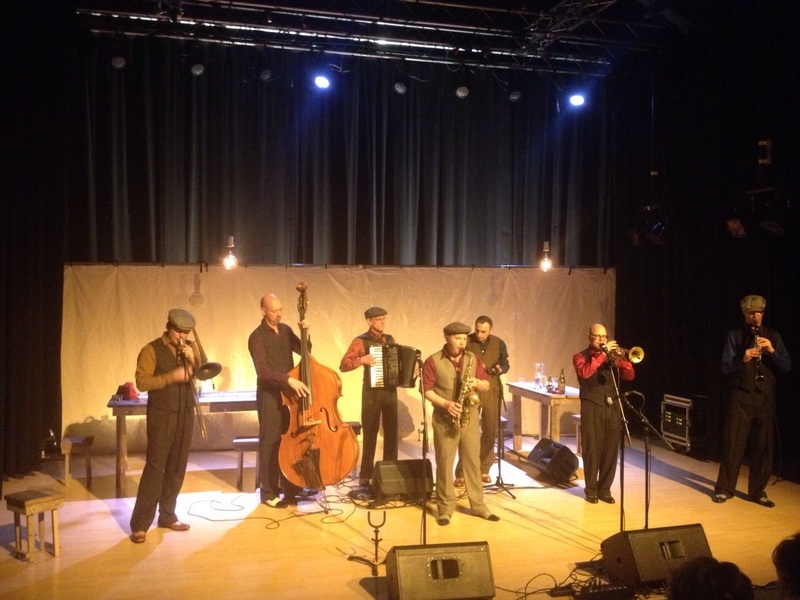 In 2014 the Amsterdam Klezmer Band embarked on a poetic theatrical tour in which the band explored new layers within their music. The performance Benja allowed time for longer pieces with subtle solos and compelling interplay of brass. Benja received rave reviews and drew full houses. And despite the more subdued mood, by the end of the evening the crowd was cheering and dancing once again. The inevitable result of the AKB’s infectious music and passionate energy. In 2016, the AKB celebrates its twentieth anniversary with the release of a special album: Oyoyoy. On their fourteenth album, the band searches for the heart of their musical inspiration and explores the boundaries of their own eclectic and influential style. As a bonus, the AKB invited five friends to remix some of the new songs. The result: seven infectious Klezmer tracks that keep traditional music fresh, urgent and very danceable. 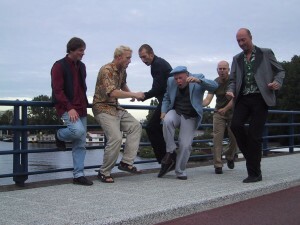 Oyoyoy is the natural next step in the evolution of progressive Klezmer from Amsterdam. The CD comes with a 24-page booklet and has fascinating glow in the dark cover. A special printing technique will make pictures visible only with the lights turned off. Obviously, the spectacular artwork will have its maximum effect on the vinyl edition, making it a genuine collector’s item. The artwork symbolizes the wide range of topics and moods of the songs. Some tracks illuminate the joy of wild parties that go on until dawn, other songs, by contrast, beg for peace and tranquility.